SAP Notes 2161288 and 2313846 introduce report CRM_IC_CHECK_CUSTOMIZING which helps me a lot when supporting CRM Interaction Center issues. In this blog, I would like to share with you how. The main reason why I like this report is, it gives me a quite easy overview on how a CRM IC Web Client business role is set up on customer site and I execute it before starting with my analysis (if available). Some checks can be triggered manually if the customizing is really used by the business. Especially, the links to navigate to the related customizing really accelerates my analysis if I want to know more. For process related customizing, I usually use the sections described below as there I also can see related customizing without further navigation. Section General Business Role Customizing contains information about UI Framework customizing. I have quick access to the function profile related customizing, to the technical profile and can see if there are any enhancements in the runtime profile. I can also see to which application component the work center belongs to and should be used for the incident and I can navigate to the related transaction launcher customizing for logical links of type “C” – Launch Transaction. Point “System Settings” gives me an overview about the release, which business functions are activated and important system parameters. Again, I can navigate to additional parameters if available. The next points in the report are only relevant, if the related processes are used on customer site. I can quickly review how the transaction type used as interaction record is set up, and which partner functions are automatically assigned when creating a new interaction record or the customizing which is considered during editing. Again, I can execute checks and navigate to the corresponding customizing or information. Under Agent Inbox, I quickly get an overview on the used agent inbox profile and to the inbox items assigned to it. I can further navigate to the items and review again the related customizing. For example for inbox items of type OneOrder, I can see the related Transaction customizing, the agent inbox partner and status mapping. Especially the status mapping is helpful because it allows me to see which system or user status is considered when search for a specific agent inbox status. I hope I could give you a good overview on how this report supports me in providing support. It still needs expertise and product knowhow, so that the information shown can be interpreted. 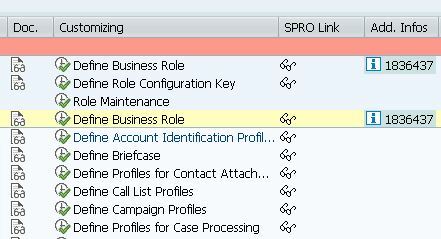 To learn more, the embedded links to SAP Knowledge Base Articles, SPRO information are helpful. 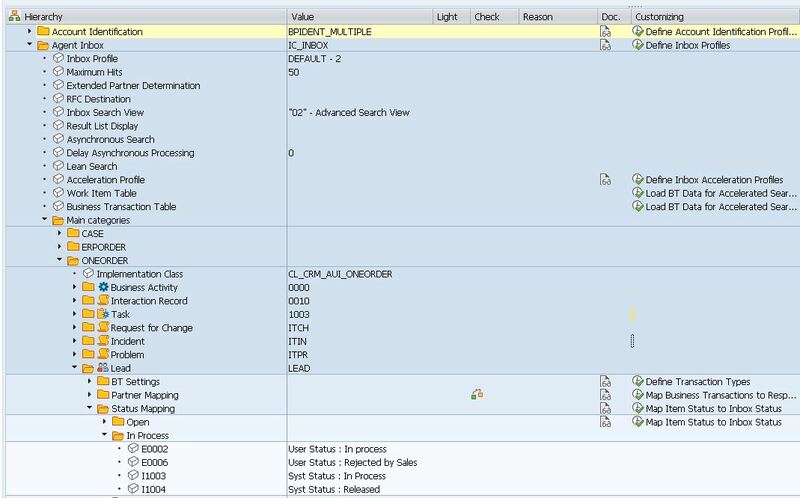 Implementing the SAP Notes before opening a customer incident helps us from support for sure. If you also troubleshoot CRM IC problems or want help when navigating through important IC customizing nodes, try it out yourself and share your experiences and feedback with me in a comment to this blog. I used this report to check customizing and trobleshooting some issues we had. 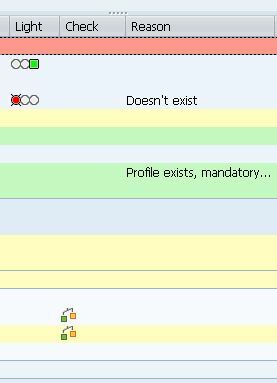 In using it I noticed that under the System Settings ->Business Functions there is a list of Business Functions displayed as “Inactive” while, I’m sure, they have been activated. Did you ever experienced this behavior of the report? 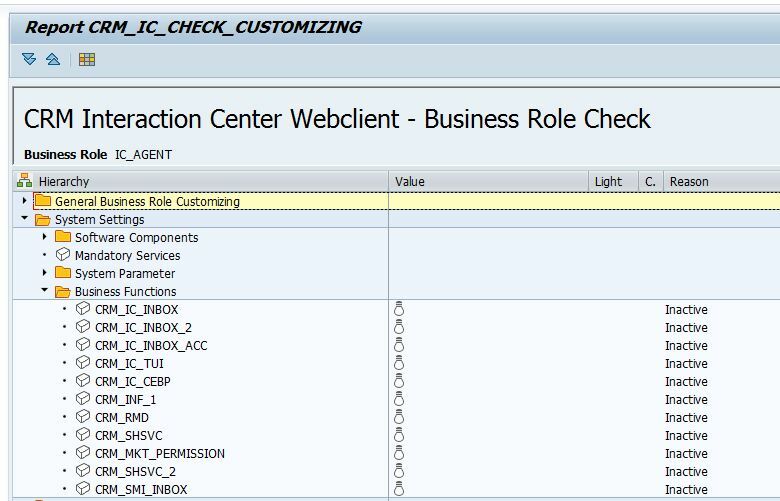 Did you use menu point “Switch Framework Customizing” to check if those business functions you expect to be activated are activated? It simply starts transaction SFW5. Please let me know if you identify any inconsistencies and the report shows different data then transaction SFW5. In this case we rely on the info displayed in SFC, just wanted to point out this inconsistency. Please let me know if you want additional info to investigate. Hi Damiano, Thanks a lot for letting me know. I will do further investigations on that.